Very wealthy investors get – and keep – their money flowing with conservative strategies that echo the best investing advice from King Solomon, a very wealthy monarch in his own tight. Even the flashiest entertainer or entrepreneur builds wealth by exercising a combination of wisdom and prudence, Solomon’s own essential virtues for living a prosperous life. Very wealthy investors cast a wide net, putting money into solid investments in places far beyond their local area. They keep an eye on trends in emerging markets, often putting money into lesser known areas and enterprises under the radar of conventional investing wisdom. Investors in income property can use this strategy too — by taking Jason Hartman’s advice to diversify, looking beyond local markets for potential good deals. Investing in another city – or another country – creates a hedge against downturns in any one market. The ultra-rich are pretty conservative when it comes to investing. They sink their money into tangibles like property, precious metals and even art. Stocks and securities make up a surprisingly small part of their portfolios. Rich investors have a plan and they look for good investing advice to help them implement it. Although they’re in charge of their investing decisions, they recognize the need for qualified money managers to execute those decisions. That’s good advice for the independent property investor – and one of Jason Hartman’s investing commandments too. You don’t have to be a multimillionaire investor to learn about investing and locate the best advice you can afford. Whether they’re the face of a corporation or a face on a billboard, ultra-wealthy investors invest in themselves. They recognize that their image and their brand plays a role in their investing success and they put money toward developing and protecting that brand. And you don’t have to have that high a profile to recognize the importance of seeing your investing career as a business, with a story and a personal brand all its own. That means investing in the right tools for managing your enterprise, from courses to computer software. And it also means creating and presenting a professional image when you’re conducting investing business, such as interviewing tenants. 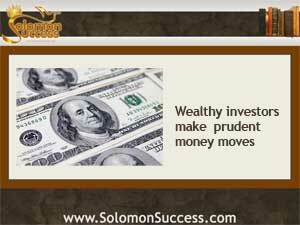 Solomon Success is the complete solution for Christian investors. Read more from our archives:New Bank Fraud Settlement, New Lending Rules? AFter the Shutdown Whither the Dollar?